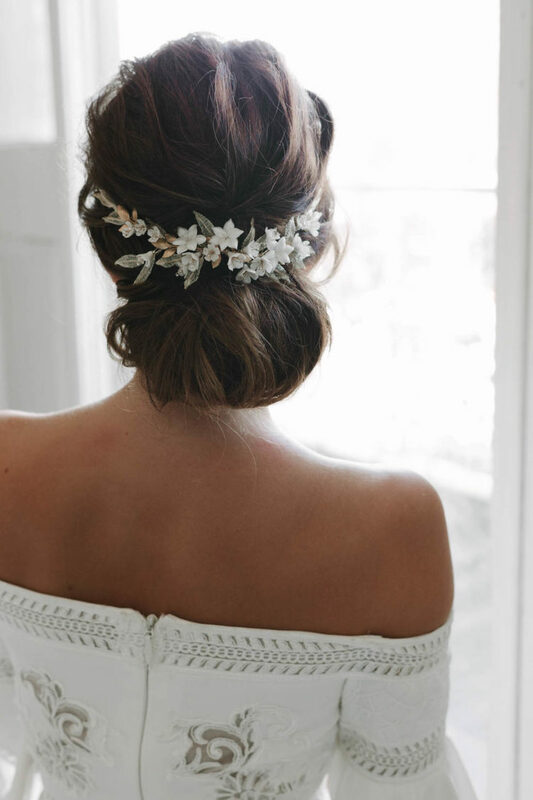 There’s a certain magic in the Versailles floral wedding headpiece. A wildly intriguing piece with regal appeal, it channels an opulent and refined feminine look with high fashion styling. A beautiful heirloom piece, perfect for a bride looking to start her own traditions. The Versailles headpiece features fine golden leaves in two tones of gold or silver for a textured and delicate look. Handcrafted clay flowers in a beautiful shade of soft ivory are scattered along the piece for a look that’s ultra feminine and elegant. Botanicus perfectus. *LIMITED QUANTITIES – Due to the popularity of the Versailles headpiece, we have limited materials available to create this design. If you love this headpiece, we recommend you secure it before we are no longer able to recreate it. Featuring handcrafted clay flowers, Czech seed beads, gilded findings. Please note: this design does not include green tones. The Versailles floral wedding headpiece is ready to ship. Please allow 5-7 business days for processing plus delivery times. A headpiece designed for ultra feminine and flattering necklines, the Versailles suits cap sleeves, off-the-shoulder dresses, illusion necklines, sheer-panelled dresses, long sleeves and princess cut gowns. It’s a sturdy and flexible headpiece with a wire base that can be manipulated to the contours of your bridal hairstyle. It attaches to two metal hair combs which can be secured to the hair with bobby pins in an X shape under the hair. Wear the Versailles along a low set chignon. For an ultra romantic look, style the Versailles headpiece with a half up/half down hairstyle for an eternally elegant and refined look. We love the look of the Versailles with a wedding veil. The distance between the combs on the headpiece allow for a veil’s comb to slot in between seamlessly creating a clean and sophisticated bridal look. Browse our full veil collection or contact us and we’d be happy to offer a recommendation to suit the Versailles based on your wedding dress and hairstyle.